In addition to dockage, boaters can purchase non-dockage products like fuel, metered electric and ice when they visit your marina. 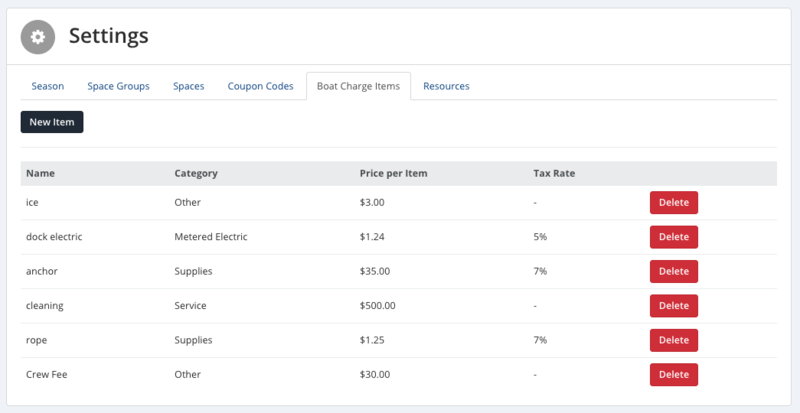 With the addition of our new Boat Charges feature, you can charge boaters for all products your marina offers - dockage and non-dockage alike - directly through a boater's Dockwa reservation. When you use Boat Charges at your marina, your boaters can, essentially, create a House Account with you each time they stay with you. Just as hotel guests can choose to charge meals, valet service, and other non-lodging products to their room bill, you can now charge non-dockage products (ice, fuel, metered electric) to your customer's Dockwa bill. Your customers will love the convenience of never needing to take out their wallet, and you'll love the convenience of keeping all of your customer's transactions in one place. Dockwa bills boaters for Boat Charges on the last day of their stay, or the next time Dockwa bills their credit card, whichever comes first. You'll be paid for Boat Charges in the transfer payment that follows the date your boater is charged (for more on how Boat Charge billing works, head on over to our support desk). 1. 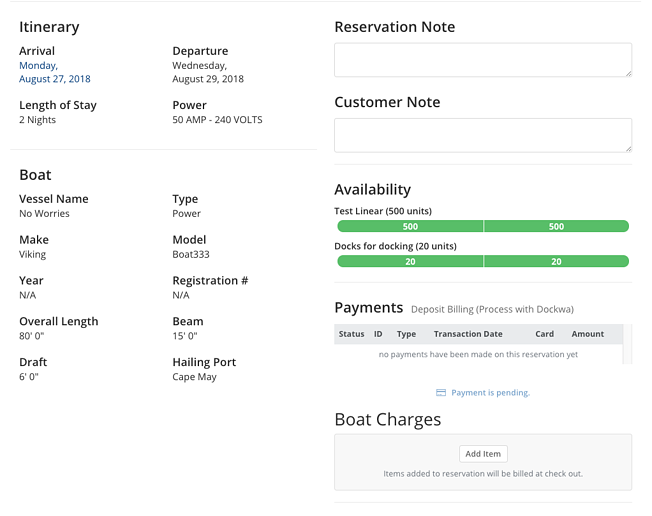 To add a non-dockage charge to a boater's Dockwa bill, navigate to any active reservation in Dockwa. You'll see a section called "Boat Charges" on the reservation details page. 2. In the Boat Charges section, click "Add Item." 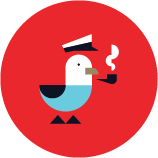 A popup will appear, prompting you to select an item to add to your boater's reservation. 3. In the "Item" dropdown, select which Boat Charge you'd like to add to a boater's reservation. If you have not yet added any Boat Charge Items to your system, or would like to create a new item not yet in your system, click "Create New Item." 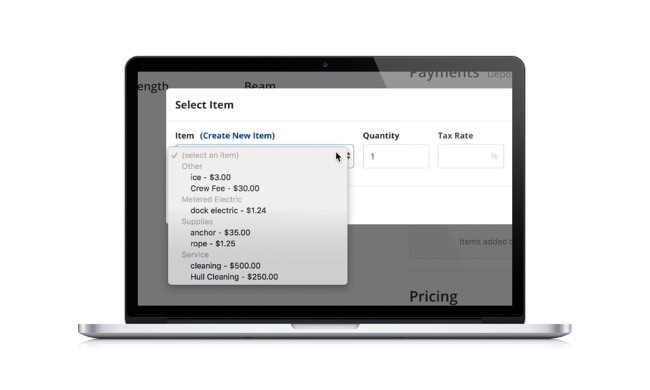 You'll be prompted by another screen to complete the New Item details, including its Category, Name, Tax Rate and Price. You control these details completely and can always update each field in the Settings section of your profile! Once you have added a new item, you will be able to charge this item to a boater. Items are saved and are easily updated in your Settings. 4. Once you've added a Boat Charge to a boater's reservation, you'll see these charges included in their reservation total. From the start of your boater's confirmed reservation (even before your boater arrives! 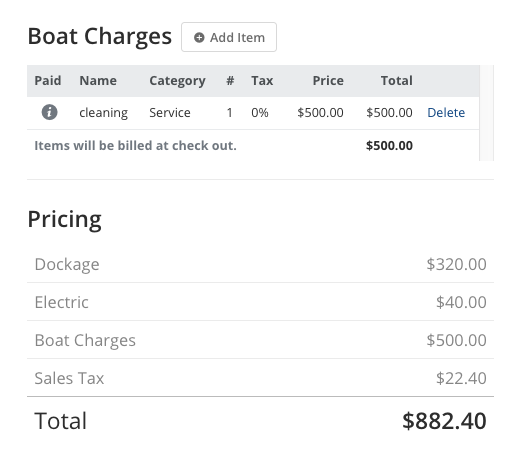 ), you can add, remove, and modify charges as much as you and your boater need. You can also add charges up to seven days after your boater has checked out. "We are very happy with [the Boat Charges Feature]. It has worked very well!" You're officially a reservation pro! 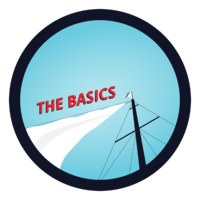 Our next lesson shows you how to track the money you earn from dockage and Boat Charges via weekly or monthly Transfer Reports.